Pesarattu is very famous in Andhra. 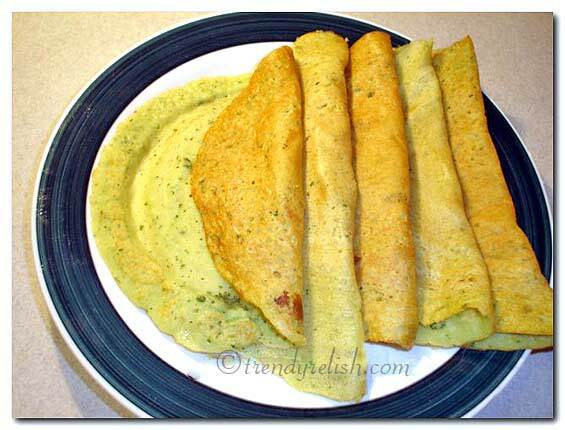 It is nothing but a different kind of dosa made with yellow lentils (Moong Dal, Pesara Pappu). I have added spiciness to the original pesarattu with green chilies, ginger and onion. It gave the pesarattu a good spicy taste and smelled great too. If that much spiciness is not desired, all the spicy things can be avoided while grinding and just the dal, cumin seeds, rice flour and salt can be added to make it non-spicy. Soak the moong dal for 2 hours and grind it into a smooth paste along with the green chilies, cumin seeds, ginger, cilantro leaves, onion and salt. Add the rice flour during half way of the grinding. Make it into medium consistency batter by adding some water. Heat a non-stick pan. When it is hot, pour a ladleful of the batter and spread evenly into a round shape. Sprinkle some oil around the pesarattu and cover. After some time, remove the cover and flip the pesarattu over. Again cover and leave it for some time. When the pesarttu appears to be cooked, remove it from the pan and transfer to a serving plate. Repeat the same process with remaining batter. This pesarattu can be eaten just like that as it already spicy or can be eaten with any chutney, if more spiciness is needed. Serve hot. We usually eat this Pesarattu along with Upma. This Moong Dal Pesarattu goes to Dosa Mela being hosted by Srivalli of Cooking 4 All Seasons. I have not used cumin. I should try it out.Thanks for sharing. He he, i was wondering why u didn't post this pesarattu may be with upma .. and here you are :) beautiful Pesarattu Uma.Great entry from ur side. The dosas looks so soft and delicious! I've never tried making pesarattu at home before, but this looks really easy and yummy! Thanks, Uma! wonderful entry, Uma. I love it. Thank U uma for Sharing..Adding Rice flour will make the dosa's get into shape and crisp nna..I will try that. 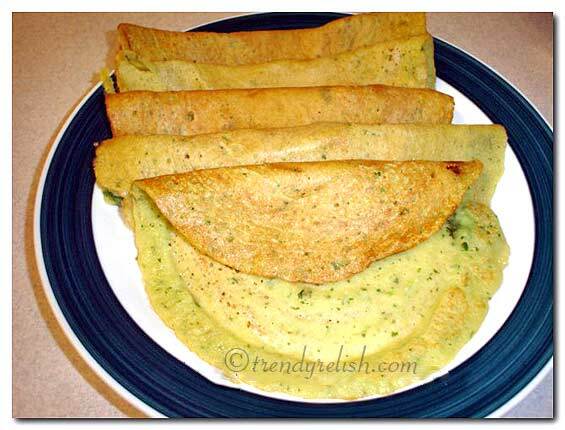 Pesarattlu chala chala ruchi ga unnayi Uma.. chala simple recipe and 'Pesarattu-Upma' is the best combination kada?.. Lovely entry! Pesarattu looks lovely ! i see slight changes from how i made. I like with moong dal too..don't have to soak for too long. Uma, gosh, how gorgeous! And I love the fact that it needs just two hours of soaking time. I absolutely have to try this. have always wanted to try pesarattu, didn't have the recipe so far....thanks for sharing. I've been seeing this one around... the combination with upma still sounds strange to me, but I guess it must be good since it sure is popular... :D Yours look great Uma! Looks great!...thanks for the lovely entry!...Happy Ugadi to you! I usually prepare it with green moong daal Uma. Recently I sprouted the green moong daal and prepared pesarattu, it tasted very good. WOW TASTY AND ROASTY PESSARATU. LOOKS SO DELICIOUS UMA.THANKS FOR SHARING. Hi....Uma, I tried it.....It is really very very tasty....I never has such a tasty and delicious pesarattu. Thank you soooooo much for posting this recepie.